This is cooking at its easiest but with great results. The prawns taste delicious cooked in the hot, garlicky, winey sauce and ready to eat in 10 mins! 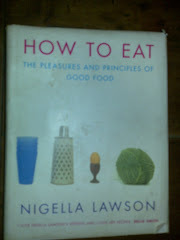 I cooked it for lunch for myself, home alone while Tara had taken Marni to see claire, george and family. - Cook 1 clove chopped garlic and 1 fresh red chilli in 1 tablespoons olive oil on a low heat for 2 mins, trying to infuse rather than fry. - Turn the heat up and cook 150g fresh raw (300g frozen) prawns for a couple of mins so they are still tender. - Add 75ml white wine, allow it to bubble up, then season to taste and serve with chopped parsley. 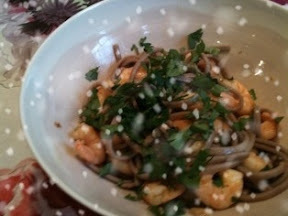 Nigella recommends eating it with baguette but i had it with soba noodles.